American trypanosomiasis, or Chagas disease, is caused by the protozoan parasite, Trypanosoma cruzi. Sixteen to eighteen million people are currently infected with this organism, and 45,000 deaths are attributed to the disease each year. Infection with T. cruzi is life-long, and 10-30% of persons who harbor the parasite chronically develop cardiac and gastrointestinal problems associated with the parasitosis. Although major progress has been made in recent years in reducing vector-borne and transfusion-associated transmission of T. cruzi, the burden of disability and death in persons chronically infected with the organism continues to be enormous. Eight to ten million persons born in countries in which Chagas disease is endemic currently reside in the United States, and epidemiologic and census data suggest that 50,000-100,000 are chronically infected with T. cruzi. The presence of these infected persons poses a risk of transmission of the parasite in the USA through blood transfusion and organ transplantation and several such cases have now been documented. 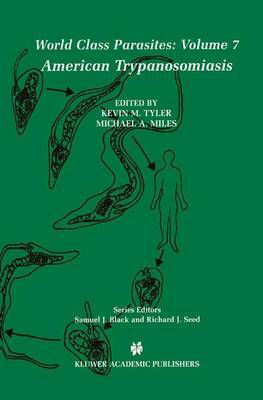 American Trypanosomiasis, volume seven of World Class Parasites is written for students of tropical medicine, parasitology and public health, for researchers and practitioners alike who wish to bring themselves abreast of the status quo with respect to this disease. It is intended to supplement formal textbooks, in order to broaden and illuminate current areas of scientific and public health concern. Uniquely for T. cruzi, this book addresses parasite, vector and host biology, the pathogenesis of Chagas disease and current and prospective therapeutics and control strategies in a single volume.